A young girls was killed and two others were injured when an Maruti car fell in to a deep gorge at 6 Kilo on Sunday. 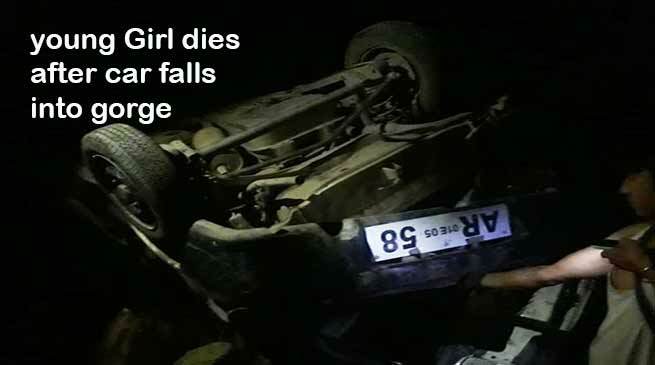 One young girl died on spot while Two critically injured when a Maruti Car driven by a lady fell into deep gorge near prayer centre at 6 kilo on Sunday. Itanagar SDPO Kamdam Sikom , informed that the accident took place at around 8 PM on Sunday when a Maruti Car bearing registration No- AR 01 E 0558 fell just below prayer centre into a deep gorge around 300 feet below the road. The car was driven by a lady Tame Mangche, (44 ) a resident of 6 Kilo area between Itanagar-Naharlagun . A young girl aged around 18 years died on spot while the driver and a boy aged around 14 years critically injured. The deceased have been identified as Marjina Basumatary d/o Birason Basumatary . After conducting the legal formalities and order of Magistrate the body have been handed over to the parents for conducting last rite at their native home near Pichola in Assam. The injured lady driver stated to be in critical and now forwarded to Tamo Riba Institute of Health and Medical Science (TRIHMS) Naharlagun while the boy is out of danger and got hand fractured. Sikom said. A case has been registered at Itanagar Police Station vide case No- 322/18 u/s- 279, 338, 304 (A) and investigation have been launched. Sikom added.